I have sincerely grown to love the live music scene here in Baltimore. 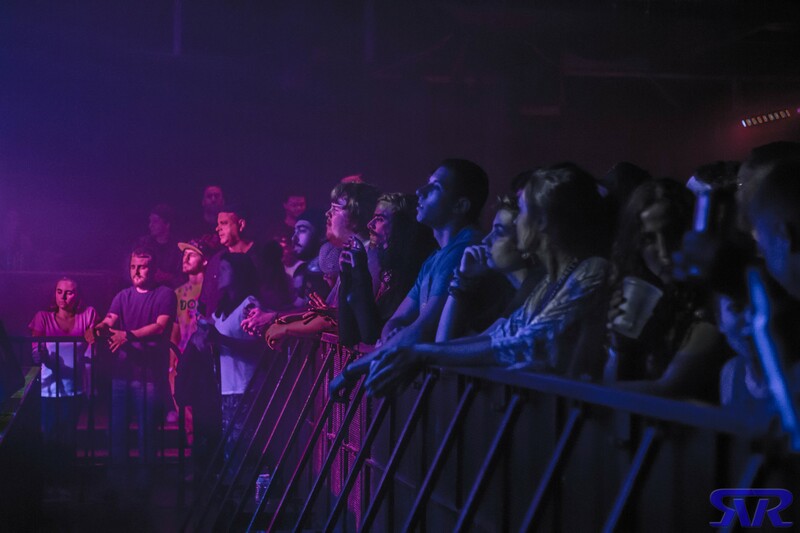 There is a wide range of venues, all shapes and sizes, and the people who attend have cultivated a genuine community. 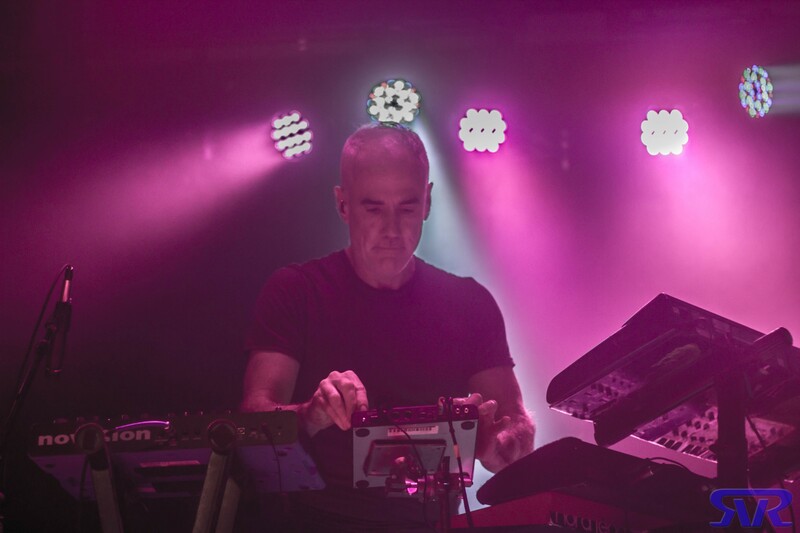 On Friday, November 6, 2015, excitement was palpable among the local scene, buzzing about the impending EOTO show featuring the one and only Mike Rempel of Lotus. For those who are unfamiliar with the unparalleled EOTO, the duo is comprised of Michael Travis and Jason Hann. Outside of EOTO, Travis and Hann team up to form the rhythm section for The String Cheese Incident. These two veterans of the jam scene formed EOTO as a side project in the mid-2000s, and today it has become its own animal, boasting a dedicated fanbase of its own that rivals any and all of the most prominent bands on the circuit. 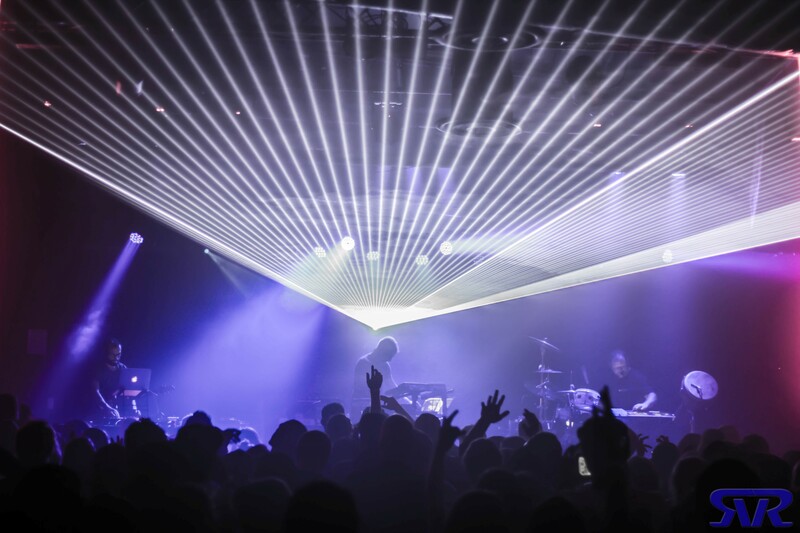 EOTO has dedicated itself to the art of improvisation, utilizing a wide range of electronic music genres but without compromising the “live” aspect of “live music.” The result is an epic musical journey, accompanied by one of the most intense laser light shows in live music. First, however, we were treated to a couple of local opening acts to warm up our feet and get us in the groove. Highland, a young duo named for their hometown of Highland, MD, kicked off the evening. The vibe was mostly laid back but with enough oomph to keep us on our feet. The young duo are certainly talented producers, but my only criticism is that they need to work on controlling the energy of a live set a bit better. Next up was the Baltimore native Bunk Buddha. I have had the pleasure of working with these guys in the past, and I was already stoked to see them in this opening slot. Starting off as a solo project by a single producer, Bunk Buddha has expanded into a trio, consisting of Scott Donovan (DJ/Producer), Corey King (drums) and Mike Chappell (guitar/bass). The group has only been a trio for less than half a year, but they have improved significantly over that time, tightening up and honing their own unique live experience. Bunk Buddha had a packed Soundstage raging their hearts out, heightening the anticipation for what was still to come. Three men walk on stage to roaring applause from a properly warmed up crowd. The tall one in the middle introduces himself as Michael Travis and the drummer as Jason Hann. He proceeds to explain that together they are EOTO, and they just like to get on stage and mess around, 100% live improve electronic music. He continues to explain that Mike Rempel, the guitarist for Lotus, thought it was a cool idea and decided to join them for a few shows. “So, let’s get to it,” he finishes… and we’re off! Travis is surrounded by keyboards, synths and sampling equipment. Throughout the evening, he meticulously and strategically works his way around every single one of these pieces of equipment. He even pulls out a bass guitar every once in a while to throw down some funky low end. Hann drums tirelessly, never missing a single beat, never dragging or speeding up. 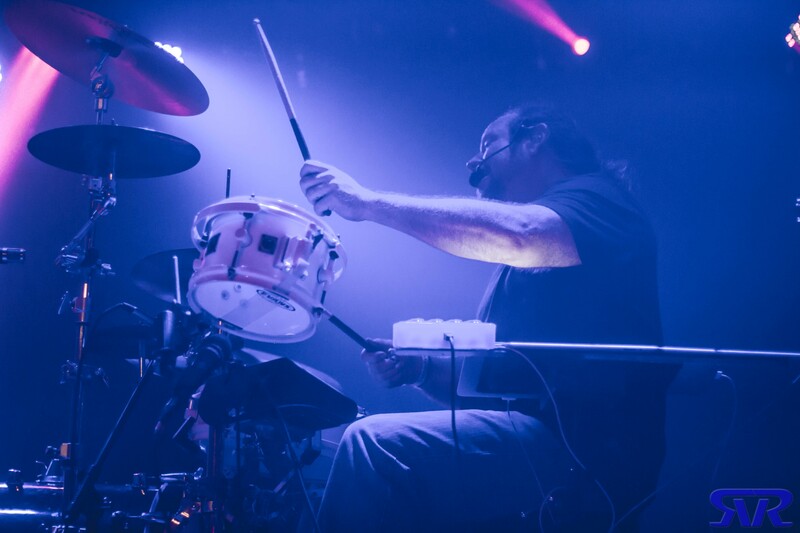 He also wears a headset with a microphone to produce live vocal samples, controlled by a console on his left… and yes, he drums with one hand while controlling his vocals. Rempel willingly joins in on this cabaret improvised bass music, switching between his guitar and production software. Meanwhile, as these three incredibly talented musicians work their way into an initial groove, the lights gradually become more and more intense. The music itself is on a whole new level. These three gentlemen have honed their crafts with such an intense fervor and desire that it truly shows in every show. Now, there are many people in the world who hear “electronic music” and immediately turn up their noses and dismiss any notion of “real music.” They say that these people are just pressing play and that the resulting emissions are just noise, not music. These people have not seen EOTO. While there are many mainstream electronic musicians who have been accused of some of these notions, I would personally argue that EOTO works harder on stage than almost any other musicians in the world. It is consistent, yet ever evolving, electronic, yet live, grounded, yet ecstatic. The deep, rumbling bass permeates the room, delving into the hearts of every single person in the room and spreading throughout their bodies until dancing becomes inevitable. All three of these gentlemen, of course, have significant practice in building a set, so it comes as no surprise that this show was built like a journey, winding down different paths but never straying from its course. 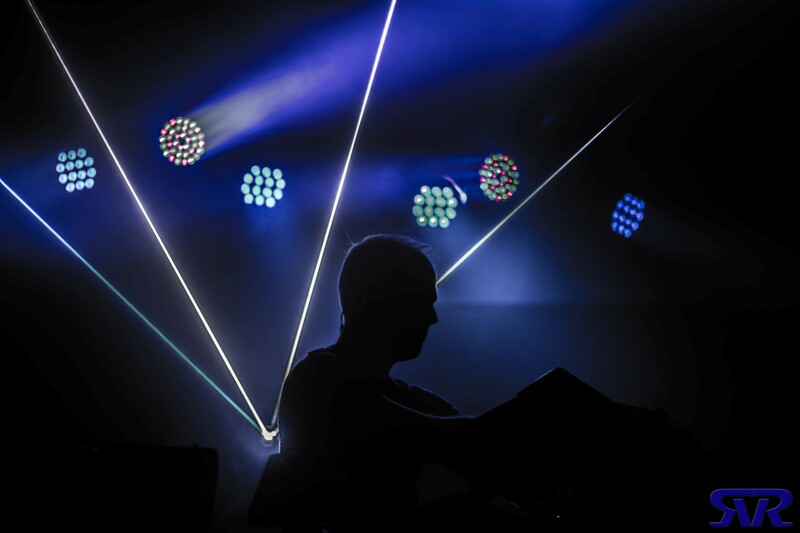 As the set built up in energy, so did the laser light show enhance its impact on the experience. By set break, the lasers were so intense that I felt like I could reach out and touch them. The second set only continued to amaze as the lights formed shapes around the stage and blasted the crowd with visual stimulation. EOTO most certainly did not disappoint. Baltimore Soundstage came out to party, packed out the venue and raged hard, and EOTO gave us exactly what we wanted. Mike Rempel added a subtly unique aspect to this EOTO experience, noticeable but not overindulgent. It was an exquisite collaboration that I’m sure EOTO fans would love to see again. We do not know, however, if the collaboration will ever see the stage together again, so as of now, it remains a one-of-a-kind experience for anyone who caught one of these shows. Thank you EOTO, and thank you Soundstage, for providing a truly unique and insanely epic live music experience. This entry was posted in Concert Reviews, Grateful Music and tagged Baltimore, Baltimore Soundstage, Bunk Buddha, Concert Review, EOTO, EOTO & Friends, Grateful Music, Highland, Live Music, Lotus, Maryland, MD, Mike Rempel, Photos, Rage, Ragin' Reviews, Review, Soundstage.